Josh’s home has a 10 Star sustainability rating and features passive heating and cooling and advanced water recycling systems. This article was published in issue 125 (Oct-Dec 2013) of Renew magazine. As a keen gardener in a dry spot like Perth, water has always been important to ABC’s Gardening Australia presenter Josh Byrne. “From my late teens on we’ve always had water saving measures in place, and as a food gardener I’m always trying to come up with better watering systems.” There was no doubt then that ‘Josh’s House’ would be a water smart home. Josh’s House is the name of his ambitious building project in the Fremantle suburb of Hilton. Josh, an environmental scientist, runs a landscape and environmental design business while juggling a media career and a young family. As if not busy enough, he embarked on a “long-held dream” to build his own environmentally sustainable home and documented every step via the open-source Josh’s House website, full of house and landscaping plans, fact sheets and videos to inspire anyone to build an energy and water saving home. The two dwellings have been built in just six and a half months, with construction finishing in May (2013). The project comprises two 10 Star homes on an 1160 m2 block, with one for his family and another for his sister-in-law. As tends to be Josh’s way, there have been no delays creating a common productive garden around the homes, with an impressive water harvesting and recycling set up. 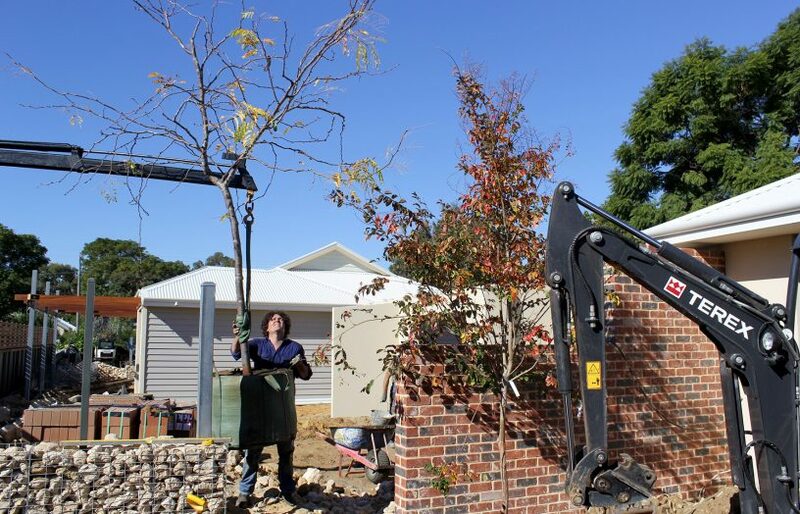 “All in all we will use less than a third of the typical Perth water scheme consumption while maintaining a beautiful and productive shady garden,” says Josh. To do this, he’s designed an integrated water system around what he calls his “water priorities”, with rainwater capture and use at the top of his list, followed by greywater and bore water. One water source feeds into another helping to keep as much water as possible for reuse or infiltration within the property. With rainwater collection a priority, an efficient rainwater system has been installed. Each home has a wet system rainwater tank, where the collection pipes run underground to connect multiple downpipes from different gutters. This makes the most of the 200 m2 roof space available on each home. An underground diversion valve is fitted so that water that sits in the pipes for too long, possibly becoming stagnant, can be flushed into an underground soakwell to seep into the surrounding soil. Josh estimates mains water backup will be needed just a few months of the year. 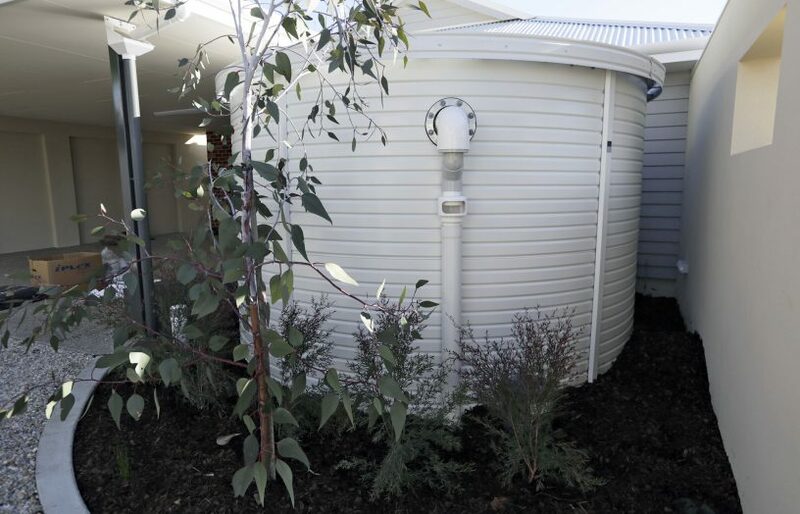 His house has a 20,000 litre poly rainwater tank and the other has a 12,000 litre tank, both plumbed to all areas inside and some parts of the garden. The first rain of the season that might contain roof debris and dirt is also flushed into the soakwell, and drinking, cooking and bathing water is filtered through sediment and carbon filters. The rainwater plan goes beyond just tanks. “You’ve got to think of the whole property as a catchment to make the most of rainwater. It doesn’t have to all go into a tank, you can include swales and rain gardens,” says Josh. Along similar lines to the soakwell, rainwater from the carport and front verandah downpipes goes into a native damp land soak feature, similar to a drain wrapped in geotextile fabric. This water infiltrates the soil and helps to recharge the groundwater, while creating a zone for water loving plants such as native rushes and sedges. Josh decided to install a direct-diversion greywater system with water that requires little treatment, such as laundry and shower water, delivered quickly to the garden. “Greywater-ready plumbing is pretty straightforward provided it is done and thought through at the beginning of the build,” he says, with the ‘builders kit’ of a sump and dual interceptor unit put in during the initial plumbing works. One reason he chose this system, the Grey Flow by Advanced Wastewater Systems, is that the filters are cleaned automatically with a filter back-flush device: “Even the most enthusiastic greywater user can get tired of cleaning filters all the time,” he says. The system diverts bathroom and laundry water before it enters the sewer, flowing through a set of filters into a buffer tank. The tank water level rises and triggers a float switch, with a pump then pushing the water through pipes to a drip-flow irrigation system. 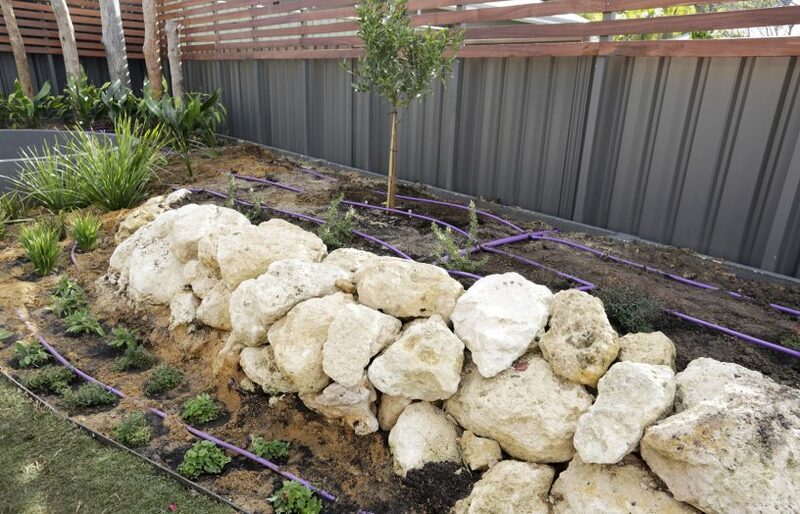 The purple irrigation hose sits above the soil but is covered with around 100 mm of mulch to keep the greywater contained, in line with WA Health Department guidelines on greywater reuse. The system pumps bore water if no water is being used in the home, such as when the households are away. The garden benefits from around 300 to 400 litres of household greywater every day, used in particular on the fruit trees and shrubs. Greywater is an integral part of the garden’s water supply so well worth the investment according to Josh. “All up the drainage plumbing cost about $1200 per house for the additional drainage pipe work. Then the greywater system itself including the pumps, filters and irrigation system cost around $2500 for supply and installation. So that’s close to $4000 all up for a complete greywater system. As well as providing savings on my irrigation water use, my garden will have a regular supply of water every day from an unrestricted source,” he says. Josh wants to see more greywater systems in new homes so he’s showing how it’s done. 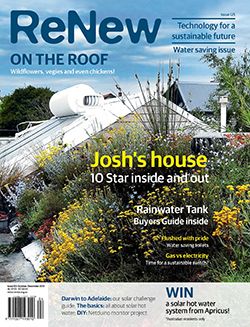 He’s produced a short video on the installation of his greywater system (see Feature Video 2 on the Josh’s House website) and helped develop a guide to greywater installation. The detailed guide Greywater-Ready Plumbing Guidelines has been released by the Water Corporation in conjunction with Josh’s environmental design business, Josh Byrne & Associates, to assist householders and plumbers select and install greywater systems. Large sections of the garden are irrigated with bore water instead of “precious and constrained scheme mains water,” including the vegetables and grass, with $6000 to $7000 spent on the bore. While some bore water use can be controversial due to the use of finite groundwater reserves, this bore taps into the superficial aquifer 30 metres below, which is recharged every year by the winter rainfall. Stormwater runs into the soakwell, damp land and permeable surfaces as a way of putting back what’s been used from groundwater. The soakwell, deliberately near the bore, is an underground modular tank made from recycled plastic drainage cells and wrapped in a permeable geotextile fabric. Water soaks into the ground while the fabric stops silt and soils from washing into the tank system. The soakwell takes overflow from the rainwater tanks as well as water flushed from the tanks’ underground pipes and first flush systems. Solid surfaces have been kept to a minimum to increase rainwater infiltration. The driveway is a permeable gravel surface so that rain can penetrate the soil; recycled plastic drainage cells over a geotextile fabric are underneath the driveway to drain excess water. The modular cells in the soakwell and driveway drainage system are made by Global Synthetics. Water use is controlled as much as possible, both inside and out, to make the most of what’s available. The house has high performance WELS-rated low-flow showerheads and taps, while the toilet features a water saving design, with a hand basin on top of the cistern so that hands can be washed with the water that fills the cistern. Water saving in the garden includes basic measures right through to high-tech irrigation systems. The soil has been improved to hold more moisture and garden beds are mulched to reduce evaporation. And the predominantly native garden won’t need water once established. The garden is split into seven different hydrozones for more efficient watering, with plants grouped together based on their common water needs. The dripline irrigation system to the hydrozones uses both soil moisture monitoring and weather monitoring to maximise water efficiency. “The scheduling of the irrigation controller will be as efficient as possible with the station run times, watering days and watering volumes determined by the hydrozoning of garden beds,” says Josh. With the integrated water system underpinning it, the garden is like a 10 Star version of the houses—an urban environment for healthy living. 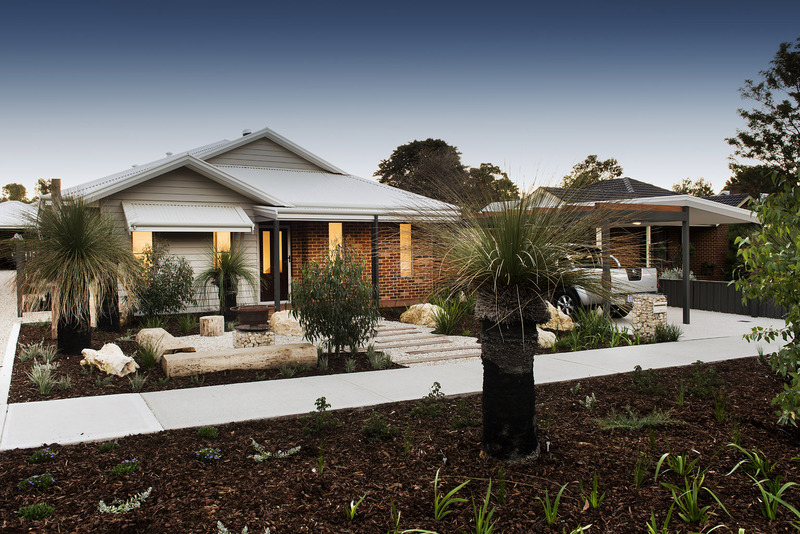 As well as being water smart, the beautiful garden also plays a very important role in passively cooling the homes. Deciduous plantings such as the grapevines growing on the north-facing pergola will shade the living areas in summer and allow sunlight inside when the leaves are lost in the cooler months. The homes are further protected by evergreen plantings on the east and west such as the vines over the front car bay. The decking on the northern side has been built with lightweight materials to reduce radiant heat, and removable shade sails will be put up in the hotter months. While the garden has been designed with sustainable water use and biodiversity in mind, it’s also a place for play and relaxation. 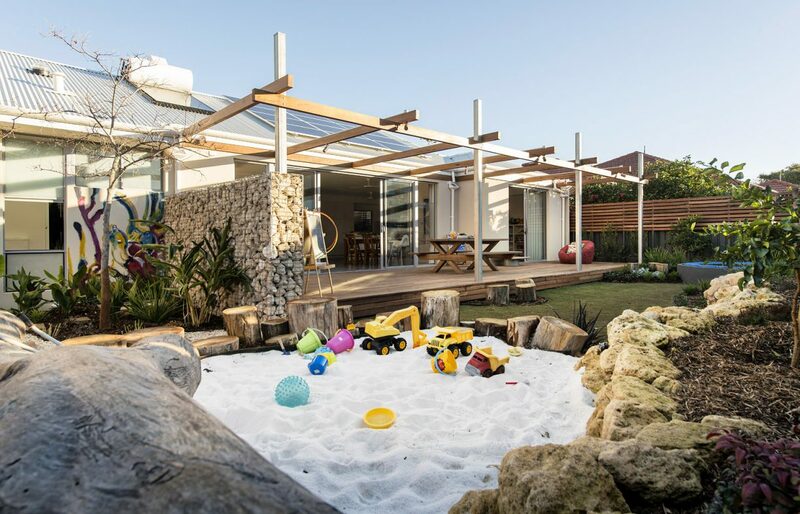 “Our garden is great for kids’ dexterity, intrigue and interest,” says Josh, with large rocks and sensory plants throughout, as well as a climbing net and sandpit. The wide front verge is planted with natives that anyone out walking their dog can appreciate, and the front yard is a perfect spot for neighbourhood get-togethers with a fire pit and stone wall seating. There’s no fence between the two homes allowing for a large shared vegetable garden. Joint fruit trees, a chook pen and composting bays help the two households be more self-sufficient. Recycled and salvaged timbers have been used extensively in the garden, although a major source of materials was unexpectedly trucked away. Josh had planned to reuse some of the original home on the block in the landscaping. Instead, one of the construction team, a wood worker, asked if he could move the house to his bush block south of Perth. It was packed up, window frames and all, with a set of plans for reference and given a new lease of life elsewhere. Josh searched the salvage yards for landscaping timbers instead. 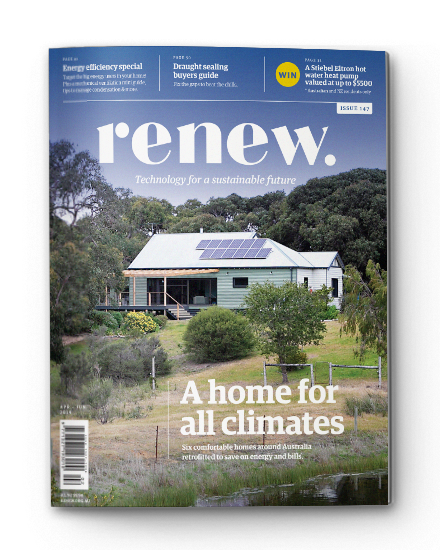 Josh Byrne was “on a mission” to build a resource-efficient home that can be replicated by industry and the wider community. The result is a home with a 10 Star NatHers rating that cost only $1200/m2 to build. With the house and landscape plans online, is this a prototype for more affordable energy efficient homes? 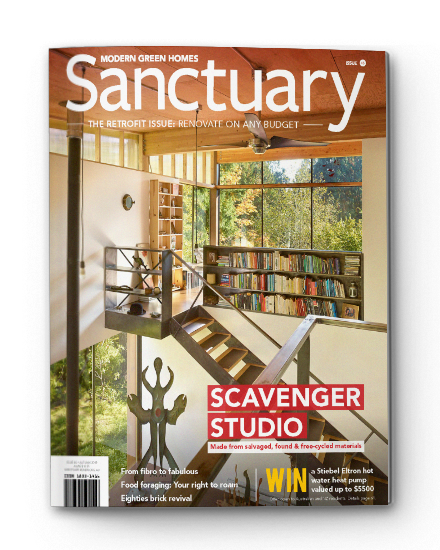 The houses were designed by WA passive solar design specialists Solar Dwellings, with a brief to use conventional building materials and construction methods. The 10 Star rating was achieved through good orientation, reverse brick veneer construction to increase internal thermal mass, high insulation levels, appropriate window sizing, placement and glazing and the simple inclusion of curtains, pelmets and shade sails. The houses run along the block’s long east-west axis to maximise the north-facing living areas. Concrete slab floors are flooded with winter sun, while other internal thermal mass includes double-brick and reverse brick veneer walls to absorb winter sun and help keep temperatures stable in summer. Only one double-glazed window was needed to achieve the 10 Star rating, in the kitchen, where a curtain couldn’t be used. All other windows are made from low-e glass with a coating on all external glass to reflect heat. The surrounding garden shades and cools the home (see main article) along with an array of windows on the south and southwest to capture cooling breezes and flush out hot air in summer. The white roof reduces heat gain as it reflects more solar radiation. With these passive cooling features there’s no need for air conditioning, nor is there heating. During the recent winter months the house warms naturally over the day and retains this heat. Josh says that the temperature gets up to 24 °C inside during the day and rarely drops below 20 °C, even when it’s a particularly frosty 2 °C over night. Bills are further reduced with a 3 kW photovoltaic system comprising REC 250 W polycrystalline silicon panels and a Chromagen gas-boosted solar hot water system. The Solatube, a tubular skylight, brightens darker zones in the house, and most other lighting is LED. 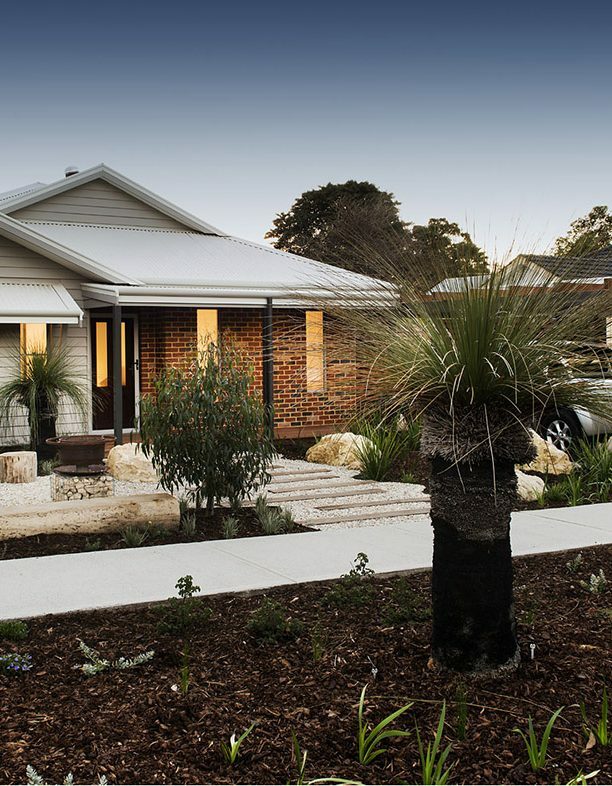 With only a handful of Australian homes holding a 10 Star Home Energy Rating there’s a lot to learn about their construction and environmental performance. Josh’s next project is a postdoctoral fellowship where he will scientifically monitor the homes over the next three years for the Low Carbon Living CRC. Josh’s House will be one of their Living Laboratories, with data loggers and a weather station already installed during construction to collect energy use data. The information will be shared via the Josh’s House website. The 10 Star rating was achieved through good orientation, reverse brick veneer construction to increase internal thermal mass, high insulation levels, appropriate window sizing, placement and glazing and the simple inclusion of curtains, pelmets and shade sails. This article was published in issue 125 (Oct-Dec 2013) of Renew magazine. Issue 125 is a water saving issue.